IRVINE, Calif.--(BUSINESS WIRE)--Enevate Corporation, a lithium-ion (Li-ion) battery technology company, announces HD-Energy® Technology for Electric Vehicles (EVs) which features extreme fast charging in only 5 minutes with high energy density and long driving range that adds up to 240 miles (390 km)—or up to 50 miles (80 km) range with a 60-second charge. This fast charge and very short charging times are better than any other Li-ion technology available today, while meeting automotive requirements for energy density, range, and cost. Enevate licenses its silicon-dominant HD-Energy® Technology to battery and EV automotive manufacturers and suppliers worldwide. This new extreme fast charge technology breaks down the barriers to electric vehicle adoption. EVs have been challenged primarily due to their limited range and drivers’ “range anxiety,” long charge times, and high cost. Now, Enevate’s groundbreaking silicon Li-ion battery technology in EV cells (NCM-based) can be charged in 5 minutes at up to a tested 10C charging rate to 75% capacity with uncompromised range and energy densities of over 750 Wh/L, where conventional graphite cells suffer significant degradation with extreme fast charging. This 5-minute charging allows flow-through charging stations where EV drivers wait just a few minutes to “fill up” just as they would with regular gas stations. In addition, with such short charging times, smaller batteries can be used in some EVs making them much more affordable. Enevate’s HD-Energy battery technology can safely charge and discharge down to -40°C and capture more energy during regenerative braking, extending their range in cold climates. A key safety benefit is that Enevate’s HD-Energy Technology is inherently resistant to lithium-plating during fast charge and also during charging in low temperatures, which is a major challenge for conventional graphite Li-ion cells. Enevate Corporation, with global headquarters in California USA, develops and licenses advanced silicon-dominant Li-ion battery technology that revolutionizes the electric vehicle (EV) market by breaking down barriers to EV adoption. 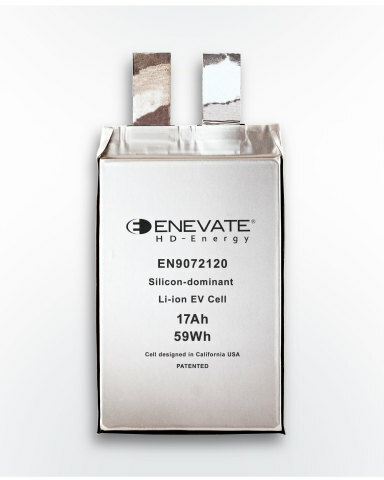 Enevate's pioneering work on silicon-dominant anodes and cells has resulted in its breakthrough HD-Energy® Technology featuring extreme fast charging with uncompromised high energy density, excellent low-temperature operation for cold climates, and safety advantages over conventional graphite Li-ion batteries. Investors include Mission Ventures, Draper Fisher Jurvetson, Tsing Capital, Infinite Potential Technologies, Presidio Ventures – a Sumitomo Corporation company, and CEC Capital. Enevate, the Enevate logo, HD-Energy, and eBoost are registered trademarks of the Enevate Corporation. 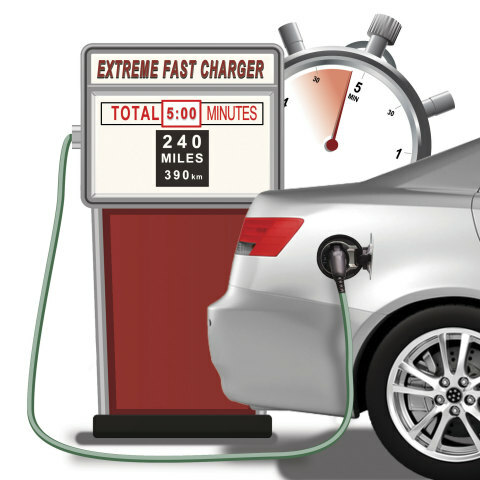 To learn more about or to license Enevate’s industry-defining battery technology, visit www.enevate.com. Enevate announces 5-minute extreme fast charge, silicon-dominant Li-ion battery technology for EVs, breaking down barriers to EV adoption.